I was reading Mike's ideas about this year on another Garden thread and i am pretty much heading that direction myself of Fruit Trees in "Glen's Almost Acre"
jfk742, MikeT and neehooya like this. Vermin extermination, devastated my mulberry last year. I think we got about 2 cups and the squirrels and jays got the rest. gssixgun and MikeT like this. I'm a fan of hoop-houses. Rebar and pvc. Very easy, also it's relatively easy to pull a cover to force-flower your pants. Depending on the crop. The frost is a tough one, and if not planned for, can be a PITA. I put extensions on the legs of my previous hoop-house due to the low head-room on the sides. Taking note of daily wind directions to maximize possible airflow through, helps to prevent some problems. gssixgun and neehooya like this. gssixgun, 32t, rolodave and 2 others like this. As most know, I only do a bit of container gardening and have a small strawberry patch. 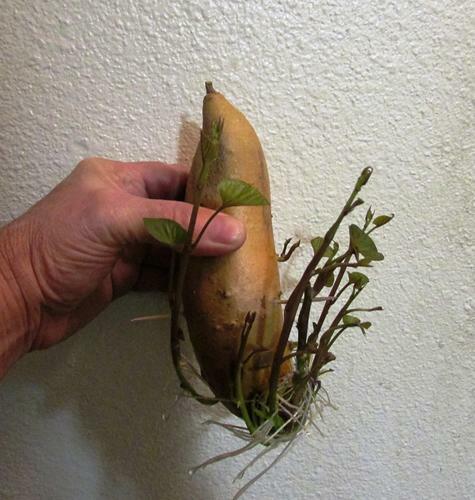 I thought I'd play a bit with seeing if I can get sweet potatoes to grow this far north. I watched some videos and I'm not very hopeful but I'll give it a go anyway. I probably got started too early but only time will tell. I'm going to be seeing if I can get these sprouts to grow inside in containers and IF they do transfer them to one of my containers. I figure that I'll use a tomato trellis and a large semi clear plastic garbage bag to cover it with. gssixgun, cudarunner, rolodave and 1 others like this. I'm thinking about getting a small freezer. We could be eating a lot of the produce we gave away last summer. gssixgun, cudarunner, 32t and 1 others like this. I'm just hoping for an overall improvement over last year's disaster. We had pretty great weather, but my girlfriend and I both dropped the ball for a little while early on, and one of the raised beds was completely taken over by rogue tomato elements. They were great but choked out everything else. The other container was also a flop with beans running riot over the place. And then I blew both my knees and *completely* ignored the garden for the better part of a month. Radishes and raspberries thrived in this atmosphere of general neglect. We had a shitload of tomatoes, huge stalks of sunflowers, and two crappy little pumpkins. Most everything else was a disaster. So we're setting a very low bar for success this year. Thanks for the reminder: it will be time to start seedlings inside soon. cudarunner, rolodave, Cangooner and 2 others like this.